The magnetic moment is the magnetic strength and orientation of a magnet or other object that produces a magnetic field. Examples of objects that have magnetic moments include: loops of electric current (such as electromagnets), permanent magnets, elementary particles (such as electrons), various molecules, and many astronomical objects (such as many planets, some moons, stars, etc). More precisely, the term magnetic moment normally refers to a system's magnetic dipole moment, the component of the magnetic moment that can be represented by an equivalent magnetic dipole: a magnetic north and south pole separated by a very small distance. 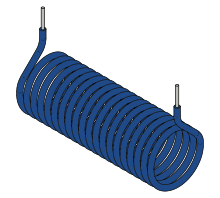 The magnetic dipole component is sufficient for small enough magnets or for large enough distances. Higher order terms (such as the magnetic quadrupole moment) may be needed in addition to the dipole moment for extended objects. The magnetic dipole moment of an object is readily defined in terms of the torque that object experiences in a given magnetic field. The same applied magnetic field creates larger torques on objects with larger magnetic moments. The strength (and direction) of this torque depends not only on the magnitude of the magnetic moment but also on its orientation relative to the direction of the magnetic field. The magnetic moment may be considered, therefore, to be a vector. The direction of the magnetic moment points from the south to north pole of the magnet (inside the magnet). 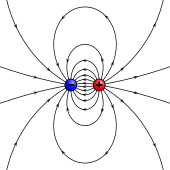 The magnetic field of a magnetic dipole is proportional to its magnetic dipole moment. The dipole component of an object's magnetic field is symmetric about the direction of its magnetic dipole moment, and decreases as the inverse cube of the distance from the object. where τ is the torque acting on the dipole, B is the external magnetic field, and m is the magnetic moment. This definition is based on how one could, in principle, measure the magnetic moment of an unknown sample. For a current loop, this definition leads to the magnitude of the magnetic dipole moment equaling the product of the current times the area of the loop. Further, this definition allows the calculation of the expected magnetic moment for any known macroscopic current distribution. Generically, the intrinsic energy includes the self-field energy of the system plus the energy of the internal workings of the system. For example, for a hydrogen atom in a 2p state in an external field, the self-field energy is negligible, so the internal energy is essentially the eigenenergy of the 2p state, which includes Coulomb potential energy and the kinetic energy of the electron. The interaction-field energy between the internal dipoles and external fields is not part of this internal energy. where N is newton (SI derived unit of force), T is tesla (SI derived unit of magnetic flux density), and J is joule (SI derived unit of energy). Although torque (N·m) and energy (J) are dimensionally equivalent, torques are never expressed in units of energy. where statA is statamperes, cm is centimeters, erg is ergs, and G is gauss. The ratio of these two non-equivalent CGS units (EMU/ESU) is equal to the speed of light in free space, expressed in cm⋅s−1. All formulae in this article are correct in SI units; they may need to be changed for use in other unit systems. For example, in SI units, a loop of current with current I and area A has magnetic moment IA (see below), but in Gaussian units the magnetic moment is IA/c. Other units for measuring the magnetic dipole moment include the Bohr magneton and the nuclear magneton. The magnetic moments of objects are typically measured with devices called magnetometers. Not all magnetometers measure magnetic moment though. Some are configured to measure magnetic field instead. If the magnetic field surrounding an object is known well enough, though, then the magnetic moment can be calculated from that magnetic field. is the volume of the bar magnet. is the residual flux density, expressed in teslas. is the volume (m3) of the magnet. is the permeability of vacuum. The preferred classical explanation of a magnetic moment has changed over time. Before the 1930s, textbooks explained the moment using hypothetical magnetic point charges. Since then, most have defined it in terms of Ampèrian currents. In magnetic materials, the cause of the magnetic moment are the spin and orbital angular momentum states of the electrons, and varies depending on whether atoms in one region are aligned with atoms in another. An electrostatic analog for a magnetic moment: two opposing charges separated by a finite distance. It points in the direction from South to North pole. The analogy with electric dipoles should not be taken too far because magnetic dipoles are associated with angular momentum (see Relation to angular momentum). Nevertheless, magnetic poles are very useful for magnetostatic calculations, particularly in applications to ferromagnets. Practitioners using the magnetic pole approach generally represent the magnetic field by the irrotational field H, in analogy to the electric field E.
The Amperian loop model: A current loop (ring) that goes into the page at the x and comes out at the dot produces a B-field (lines). The north pole is to the right and the south to the left. where S is the area of the loop. The direction of the magnetic moment is in a direction normal to the area enclosed by the current consistent with the direction of the current using the right hand rule. which is how the magnetic dipole moment for an Amperian loop is derived. When calculating the magnetic moments of materials or molecules on the microscopic level it is often convenient to use a third model for the magnetic moment that exploits the linear relationship between the angular momentum and the magnetic moment of a particle. While this relation is straight forward to develop for macroscopic currents using the amperian loop model (see below), neither the magnetic pole model nor the amperian loop model truly represents what is occurring at the atomic and molecular levels. At that level quantum mechanics must be used. Fortunately, the linear relationship between the magnetic dipole moment of a particle and its angular momentum still holds; although it is different for each particle. Further, care must be used to distinguish between the intrinsic angular momentum (or spin) of the particle and the particle's orbital angular momentum. See below for more details. This is valid for the moment due to any localized current distribution provided that the magnetic field is uniform. For non-uniform B the equation is also valid for the torque about the center of the magnetic dipole provided that the magnetic dipole is small enough. An electron, nucleus, or atom placed in a uniform magnetic field will precess with a frequency known as the Larmor frequency. See Resonance. In all these expressions m is the dipole and B is the magnetic field at its position. Note that if there are no currents or time-varying electrical fields ∇ × B = 0 and the two expressions agree. In addition, an applied magnetic field can change the magnetic moment of the object itself; for example by magnetizing it. This phenomenon is known as magnetism. An applied magnetic field can flip the magnetic dipoles that make up the material causing both paramagnetism and ferromagnetism. Additionally, the magnetic field can affect the currents that create the magnetic fields (such as the atomic orbits) which causes diamagnetism. Magnetic field lines around a "magnetostatic dipole". 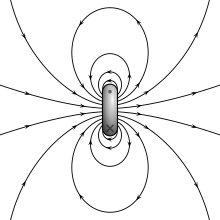 The magnetic dipole itself is located in the center of the figure, seen from the side, and pointing upward. Any system possessing a net magnetic dipole moment m will produce a dipolar magnetic field (described below) in the space surrounding the system. While the net magnetic field produced by the system can also have higher-order multipole components, those will drop off with distance more rapidly, so that only the dipole component will dominate the magnetic field of the system at distances far away from it. The force acting on m1 is in the opposite direction. The magnetic field of any magnet can be modeled by a series of terms for which each term is more complicated (having finer angular detail) than the one before it. The first three terms of that series are called the monopole (represented by an isolated magnetic north or south pole) the dipole (represented by two equal and opposite magnetic poles), and the quadrupole (represented by four poles that together form two equal and opposite dipoles). The magnitude of the magnetic field for each term decreases progressively faster with distance than the previous term, so that at large enough distances the first non-zero term will dominate. For many magnets the first non-zero term is the magnetic dipole moment. (To date, no isolated magnetic monopoles have been experimentally detected.) A magnetic dipole is the limit of either a current loop or a pair of poles as the dimensions of the source are reduced to zero while keeping the moment constant. As long as these limits only apply to fields far from the sources, they are equivalent. However, the two models give different predictions for the internal field (see below). Traditionally, the equations for the magnetic dipole moment (and higher order terms) are derived from theoretical quantities called magnetic potentials which are simpler to deal with mathematically then the magnetic fields. where × is the vector cross product, r is the position vector, and j is the electric current density and the integral is a volume integral. is used for both equations since they produce equivalent results outside of the magnet. The two models for a dipole (current loop and magnetic poles) give the same predictions for the magnetic field far from the source. However, inside the source region, they give different predictions. The magnetic field between poles (see figure for Magnetic pole definition) is in the opposite direction to the magnetic moment (which points from the negative charge to the positive charge), while inside a current loop it is in the same direction (see the figure to the right). The limits of these fields must also be different as the sources shrink to zero size. This distinction only matters if the dipole limit is used to calculate fields inside a magnetic material. Unlike the expressions in the previous section, this limit is correct for the internal field of the dipole. These fields are related by B = μ0(H + M), where M(x) = mδ(x) is the magnetization. The magnetic moment has a close connection with angular momentum called the gyromagnetic effect. This effect is expressed on a macroscopic scale in the Einstein–de Haas effect, or "rotation by magnetization," and its inverse, the Barnett effect, or "magnetization by rotation." Further, a torque applied to a relatively isolated magnetic dipole such as an atomic nucleus can cause it to precess (rotate about the axis of the applied field). This phenomenon is used in nuclear magnetic resonance. is the angular momentum of the particle or particles that are creating the magnetic moment. where ρ is the mass density of the moving particles. By convention the direction of the cross product is given by the right-hand rule. is the charge density of the moving charged particles. is the mass of the particle. where the g-factor depends on the particle and configuration. For example the g-factor for the magnetic moment due to an electron orbiting a nucleus is one while the g-factor for the magnetic moment of electron due to its intrinsic angular momentum (spin) is a little larger than 2. The g-factor of atoms and molecules must account for the orbital and intrinsic moments of its electrons and possibly the intrinsic moment of its nuclei as well. In the atomic world the angular momentum (spin) of a particle is an integer (or half-integer in the case of spin) multiple of the reduced Planck constant ħ. This is the basis for defining the magnetic moment units of Bohr magneton (assuming charge-to-mass ratio of the electron) and nuclear magneton (assuming charge-to-mass ratio of the proton). See electron magnetic moment and Bohr magneton for more details. Fundamentally, contributions to any system's magnetic moment may come from sources of two kinds: motion of electric charges, such as electric currents; and the intrinsic magnetism of elementary particles, such as the electron. Contributions due to the sources of the first kind can be calculated from knowing the distribution of all the electric currents (or, alternatively, of all the electric charges and their velocities) inside the system, by using the formulas below. On the other hand, the magnitude of each elementary particle's intrinsic magnetic moment is a fixed number, often measured experimentally to a great precision. For example, any electron's magnetic moment is measured to be 3023071523600000000♠−9.284764×10−24 J/T. The direction of the magnetic moment of any elementary particle is entirely determined by the direction of its spin, with the negative value indicating that any electron's magnetic moment is antiparallel to its spin. the intrinsic moment of the proton. Similarly, the magnetic moment of a bar magnet is the sum of the contributing magnetic moments, which include the intrinsic and orbital magnetic moments of the unpaired electrons of the magnet's material and the nuclear magnetic moments. The negative sign occurs because electrons have negative charge. where γ is the gyromagnetic ratio, m is the magnetic moment, λ is the damping coefficient and Heff is the effective magnetic field (the external field plus any self-induced field). The first term describes precession of the moment about the effective field, while the second is a damping term related to dissipation of energy caused by interaction with the surroundings. Electrons and many elementary particles also have intrinsic magnetic moments, an explanation of which requires a quantum mechanical treatment and relates to the intrinsic angular momentum of the particles as discussed in the article Electron magnetic moment. It is these intrinsic magnetic moments that give rise to the macroscopic effects of magnetism, and other phenomena, such as electron paramagnetic resonance. where μB is the Bohr magneton, S is electron spin, and the g-factor gS is 2 according to Dirac's theory, but due to quantum electrodynamic effects it is slightly larger in reality: 7000200231930435999♠2.00231930436. The deviation from 2 is known as the anomalous magnetic dipole moment. Again it is important to notice that m is a negative constant multiplied by the spin, so the magnetic moment of the electron is antiparallel to the spin. 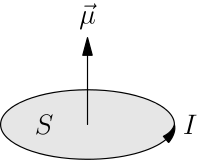 This can be understood with the following classical picture: if we imagine that the spin angular momentum is created by the electron mass spinning around some axis, the electric current that this rotation creates circulates in the opposite direction, because of the negative charge of the electron; such current loops produce a magnetic moment which is antiparallel to the spin. Hence, for a positron (the anti-particle of the electron) the magnetic moment is parallel to its spin. The nuclear system is a complex physical system consisting of nucleons, i.e., protons and neutrons. The quantum mechanical properties of the nucleons include the spin among others. Since the electromagnetic moments of the nucleus depend on the spin of the individual nucleons, one can look at these properties with measurements of nuclear moments, and more specifically the nuclear magnetic dipole moment. Most common nuclei exist in their ground state, although nuclei of some isotopes have long-lived excited states. Each energy state of a nucleus of a given isotope is characterized by a well-defined magnetic dipole moment, the magnitude of which is a fixed number, often measured experimentally to a great precision. This number is very sensitive to the individual contributions from nucleons, and a measurement or prediction of its value can reveal important information about the content of the nuclear wave function. There are several theoretical models that predict the value of the magnetic dipole moment and a number of experimental techniques aiming to carry out measurements in nuclei along the nuclear chart. The dioxygen molecule, O2, exhibits strong paramagnetism, due to unpaired spins of its outermost two electrons. The carbon dioxide molecule, CO2, mostly exhibits diamagnetism, a much weaker magnetic moment of the electron orbitals that is proportional to the external magnetic field. The nuclear magnetism of a magnetic isotope such as 13C or 17O will contribute to the molecule's magnetic moment. The dihydrogen molecule, H2, in a weak (or zero) magnetic field exhibits nuclear magnetism, and can be in a para- or an ortho- nuclear spin configuration. Many transition metal complexes are magnetic. The spin-only formula is a good first approximation for high-spin complexes of first-row transition metals. ^ a b Cullity, B. D.; Graham, C. D. (2008). Introduction to Magnetic Materials (2nd ed.). Wiley-IEEE Press. p. 103. ISBN 978-0-471-47741-9. ^ See, for example, Callen, Herbert B. (1985). Thermodynamics and an Introduction to Thermostatistics (2nd ed.). John Wiley & Sons. p. 200. ISBN 978-0-471-86256-7. where the relevant U is U[Be]. ^ "Magnetic units". IEEE Magnetics. Retrieved 19 February 2016. ^ Mohr, Peter J.; Newell, David B.; Taylor, Barry N. (21 Jul 2015). "CODATA Recommended Values of the Fundamental Physical Constants: 2014". Reviews of Modern Physics. 88 (3). arXiv:1507.07956. Bibcode:2016RvMP...88c5009M. doi:10.1103/RevModPhys.88.035009. ^ "K&J Magnetics – Glossary". www.kjmagnetics.com. ^ a b c d e f Brown, William Fuller, Jr. (1962). Magnetostatic Principles in Ferromagnetism. North-Holland. ^ Griffiths, David J. (1999). Introduction to Electrodynamics (3rd ed.). Prentice Hall. p. 258. ISBN 978-0-13-805326-0. OCLC 40251748. ^ Jackson, John David (1975). "5.6 Magnetic fields of a Localized Current Distribution, Magnetic Moment". Classical Electrodynamics. 2. ISBN 978-0-471-43132-9. ^ Griffiths, David J. (1999). Introduction to Electrodynamics (3rd ed.). Prentice Hall. p. 257. ISBN 978-0138053260. ^ Boyer, Timothy H. (1988). "The Force on a Magnetic Dipole". Am. J. Phys. 56 (8): 688–692. Bibcode:1988AmJPh..56..688B. doi:10.1119/1.15501. ^ Furlani, Edward P. (2001). Permanent Magnet and Electromechanical Devices: Materials, Analysis, and Applications. Academic Press. p. 140. ISBN 978-0-12-269951-1. ^ a b Yung, K. W.; Landecker, P. B.; Villani, D. D. (1998). "An Analytic Solution for the Force between Two Magnetic Dipoles" (PDF). Magn. Elec. Separation. 9: 39–52. doi:10.1155/1998/79537. Retrieved November 24, 2012. ^ Jackson, John David (1975). "5.6". Classical electrodynamics (2nd ed.). New York: Wiley. ISBN 9780471431329. ^ Jackson, John David (1975). Classical electrodynamics (2nd ed.). New York: Wiley. p. 184. ISBN 978-0-471-43132-9. ^ Krey, Uwe; Owen, Anthony (2007). Basic Theoretical Physics. Springer. pp. 151–152. ISBN 978-3-540-36804-5. ^ Buxton, Richard B. (2002). Introduction to functional magnetic resonance imaging. Cambridge University Press. p. 136. ISBN 978-0-521-58113-4. ^ Feynman, Richard P.; Leighton, Robert B.; Sands, Matthew (2006). The Feynman Lectures on Physics. 2. p. 13-12. ISBN 978-0-8053-9045-2. ^ "CODATA value: electron magnetic moment". ^ Tilley, R. J. D. (2004). Understanding Solids. John Wiley and Sons. p. 368. ISBN 978-0-470-85275-0. ^ Tipler, Paul Allen; Llewellyn, Ralph A. (2002). Modern Physics (4th ed.). Macmillan. p. 310. ISBN 978-0-7167-4345-3. ^ Crowther, J. A. (1949). Ions, Electrons and Ionizing Radiations (8th ed.). London: Edward Arnold. p. 270. ^ Rice, Stuart Alan (2004). Advances in chemical physics. Wiley. pp. 208ff. ISBN 978-0-471-44528-9. ^ Steiner, Marcus (2004). Micromagnetism and Electrical Resistance of Ferromagnetic Electrodes for Spin Injection Devices. Cuvillier Verlag. p. 6. ISBN 978-3-86537-176-8. ^ Figgis, B. N.; Lewis, J. (1960). "The magnetochemistry of complex compounds". In Lewis, J.; Wilkins, R. G. (eds.). Modern coordination chemistry: Principles and methods. New York: Interscience. pp. 405–407. ^ "Search results matching 'magnetic moment'". CODATA internationally recommended values of the Fundamental Physical Constants. National Institute of Standards and Technology. Retrieved 11 May 2012. Bowtell, Richard (2009). "μ – Magnetic Moment". Sixty Symbols. Brady Haran for the University of Nottingham.